The recent proposal to impose a ban on motorbikes in downtown Hanoi was based on the sole opinion of the director of the Hanoi Department of Transport, said the municipal chairman, Nguyen Duc Chung. The municipal government has yet to issue an official ban on motorbikes in the city, Chung was quoted by the local media as saying on the sidelines of an extraordinary meeting of the Hanoi People’s Council on April 9. 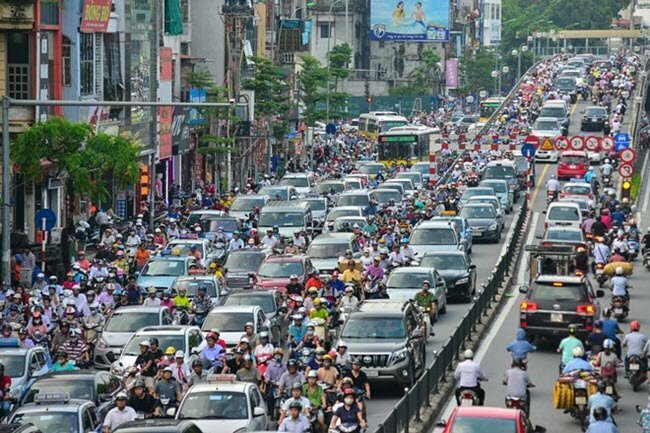 A plan to reduce the use of private vehicles, which is among several solutions to ease traffic congesion in Hanoi, was presented by the People’s Committee at a meeting convened by the People’s Council in July last year. With the current average income of residents in Hanoi and other parts of the country, motorbikes still remain the main form of personal transport for daily activities, the chairman said. The idea of imposing a ban on or minimizing the use of motorbikes in certain areas will require careful consideration and research, as nearly six million motorbikes are in use in the city at present. Accordingly, the plan should be made public to collect feedback and gain approval from the local residents before being put into effect. Also, the city will have to make sure that the locals have easier access to various forms of public transport once the use of motorbikes is restricted. The chairman added that local authorities have to encourage the locals to form the habit of walking for a maxium of 1.5 kilometers, instead of using motorbikes. The plan will be revised and publicized in the coming time.